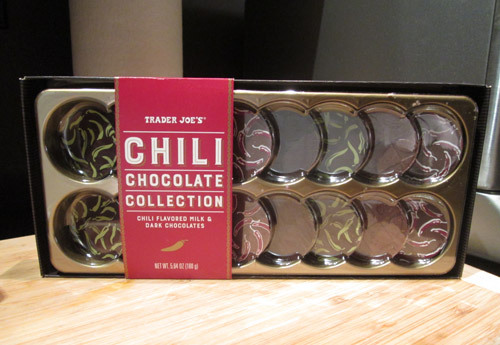 Sweet and spicy has become one of my favorite flavor combos over the past few years, so I knew I had to pick up this box of chili chocolates when I spotted them. 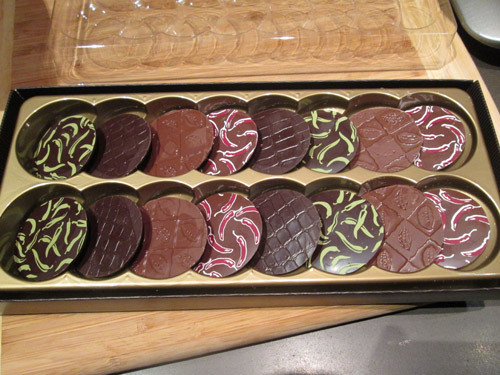 The box consists of 16 chocolates, with 4 of each flavor. 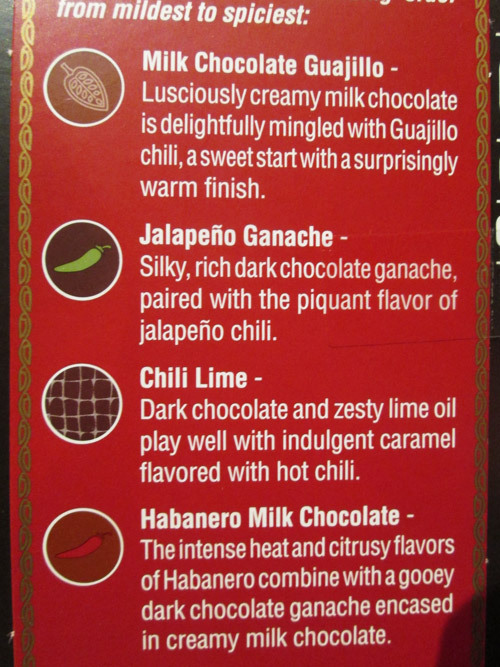 The Milk Chocolate Guajillo is allegedly the least spicy of the four, but my boyfriend and I both agreed it was actually one of the spiciest. It starts off with a sweet milk chocolate flavor and then gets super hot starting at the front of your mouth and moving towards the back. It actually became painfully spicy toward the end. The (supposedly) second spiciest is the Jalapeño Ganache, with starts with a rich chocolate flavor and then gets super hot. I’d say it’s as hot as the Milk Chocolate Guajillo. After trying these two I was a little terrified of what kind of pain I’d be in for with the two hotter chocolates, but somehow the two “spicier” chocolates (according to TJ’s, at least) were the least spicy in our opinion. The Chili Lime is supposed to be the third spiciest, which we found to be the smokiest and most mild. It has a light spiciness with a sweet caramel flavor. And lastly, the spiciest of them all (again, according to TJ’s), is the Habanero Milk Chocolate. We found this to be the second least spicy, with a gooey, almost jelly like filling in the middle, and a warmth that balances the sweetness without overpowering it like the first two.